Mecha Arena for the Palm OS is a futuristic turn based strategic/tactical wargame game between 30-foot tall highly advanced fighting machines, called Mechas. 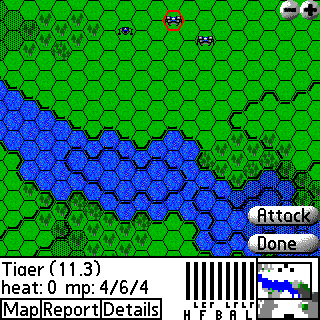 Use the terrain to your advantage and manuever your army to attack your opponents. The last Mecha standing is declared victorious. WorldWar for the Palm OS is a turn based strategy game of global conquest based on the classic board game Risk. Try to capture continents for bonus armies which will help you in your end goal, to conquer the world. Each game can have up to 6 players, including any number of human or computer (with 3 levels of difficulty) players. Copyright © 2002, Zagware. All Rights Reserved.